Oscar is looking into his past for a makeover. 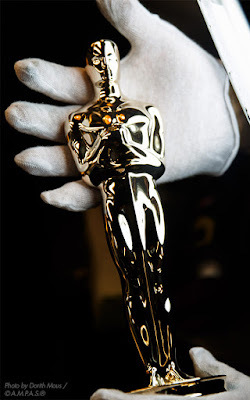 The Academy has hired Rock Tavern, New York-based company Polich Tallix Fine Art Foundry to exclusively create its iconic golden statuette, starting with Feb. 28's Academy Awards. Oscar is looking into his past for a makeover. 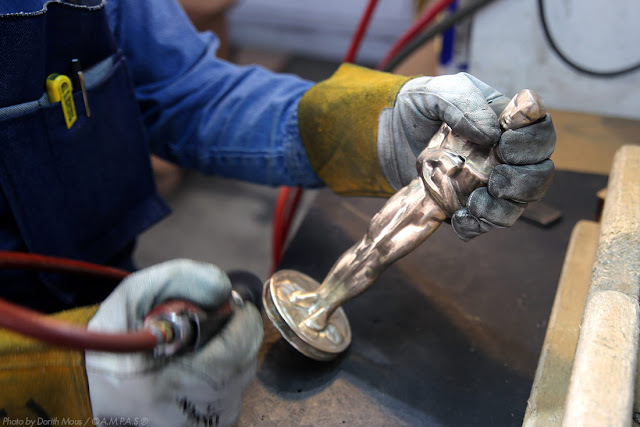 The Academy has hired Rock Tavern, New York-based company Polich Tallix Fine Art Foundry to tweak and exclusively create its iconic golden statuette, starting with Feb. 28's Academy Awards. This is big news for Oscar fans, the Academy and future winners. all surfaces have to be perfect. Using a cast bronze Oscar from 1929, artisans at Polich Tallix have restored subtle features of George Stanley’s original sculpture, which was based on sketches by MGM art director Cedric Gibbons. The overall size of the statuette— 13.5 inches tall and 8.5 pounds — remains the same. The Oscar will now be hand-cast in bronze before receiving its 24-karat gold finish, in a process that will take about three months to produce 50 statuettes. It's a sad day for Chicago-based R.S. Owens & Company, which has made the statuettes since 1982. However, the Academy says it will keep R.S. Owens on for servicing existing statuettes and creating other awards, including plaques for its annual Scientific and Technical Awards. Polich Tallix started its Oscar-making process by creating digital scans of the 1929 statuette and a modern-era pedestal base. 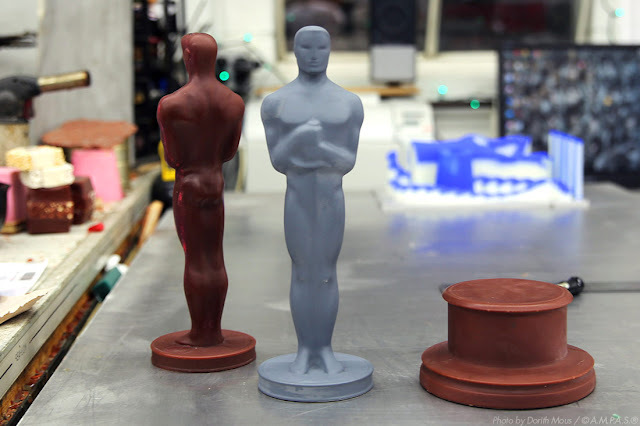 The digital Oscar was then 3-D printed (see photo above) and molded (see photo below) so the form could be cast in wax. 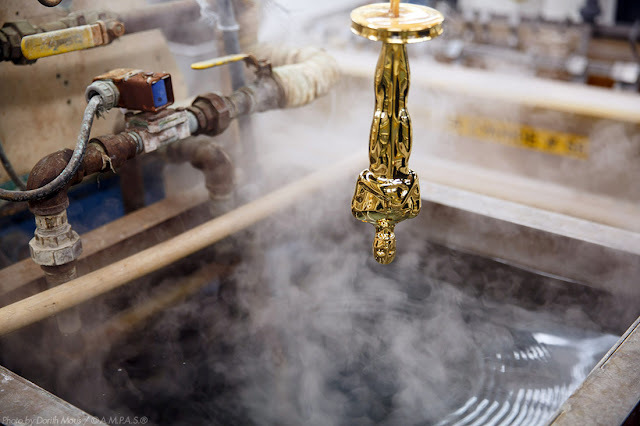 Each wax statuette is coated in a ceramic shell that is cured and fired at 1,600°F, melting the wax away and leaving an empty Oscar-shaped form. 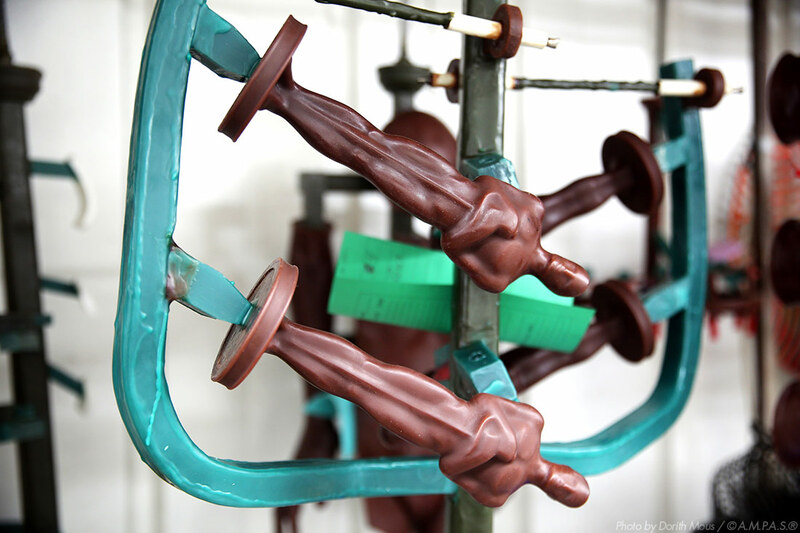 The statuettes are then cast in liquid bronze via a plumbing system (see below) at more than 1,800°F, cooled, and sanded to a mirror polish finish (see below). 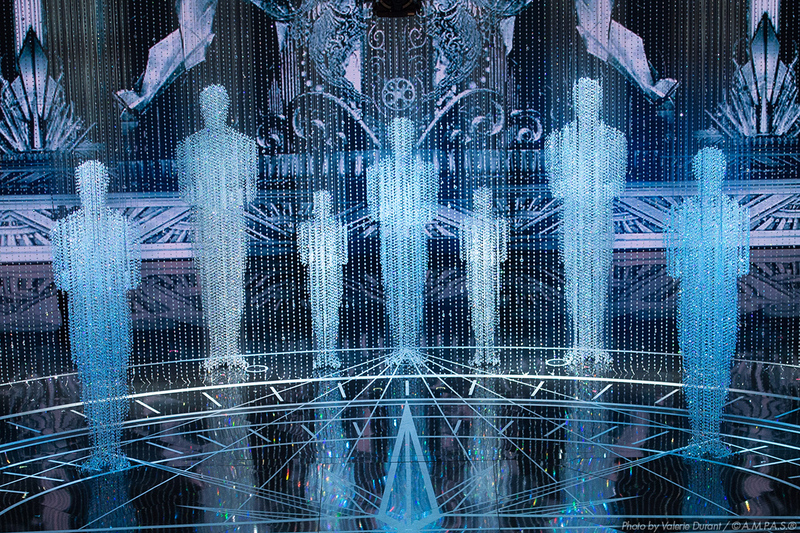 The figure portion of each Oscar is electroplated (see below) with a permanent layer of reflective 24-karat gold by Epner Technology, a renowned high-tech specification electroplating company in Brooklyn. Gold plating is only one micron thick and would not cover even the smallest indent. To accomplish a perfect surface, the castings are plated first with copper, then nickel, and polished to a high luster. Founded in 1972, Polich Tallix combines advanced technology with world-class craftsmanship as it strives to create works of art that preserve each artist’s unique purpose and vision.